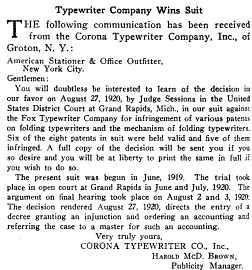 Words are Winged: Fox Typewriter Co. V. Corona Typewriter Co.
Good finds on these legal events. Foolishly, I've always thought, Corona forced the hands of other makers on the issue and they had to produce non folding machines which might then just as well be heavier and more substantial and sold along those lines, properly marketed; the result was that Corona found itself pretty quickly playing catch-up to the point that it was bought by L. C. Smith in '26 instead of lording over more lawsuits. I do not think the Corona Four is a good match for the competitors' four bank portables of the day. That's a very interesting point which I had never considered, that the ramifications of over-zealously defending patents indirectly led to the improvement of competitors machines at a pace exceeding Corona's. I've yet to truly use a Corona 4, though I've heard many people dislike how it was built and the overly complex nature of its mechanics compared to the Corona 3. 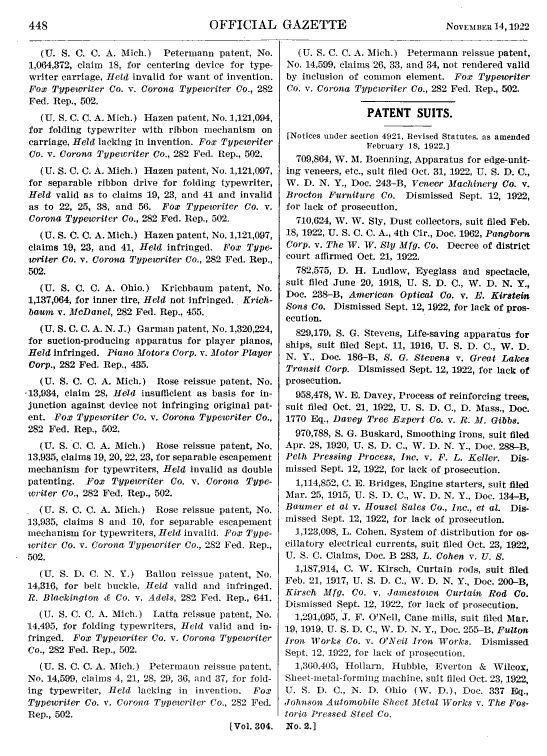 Now that I've begun to delve deeper into the specific patents Corona claimed infringed, there seem to be some very bold attempts at enforcing patents. For example the Rose re-issue patent, claim 28, specifies; "In a visible typewriting machine having a universal or standard keyboard the combination of key operated levers and type operated by said levers a carriage and a platen mounted in the carriage and normally in the path of said type and foldable with the carriage out of its normal position away from the type and Into compact relation to another part of the typewriter to occupy less space than when In use." To me, that is far too vague to be defendable as a patent and so did the judge in the later 1922 ruling. Otherwise, a typewriter which swung its carriage 90 degrees out, and then lowered down to the side of the machine would be infringing such a claim, which is utterly insane.